When Macy Miller began building her own tiny house in Boise, Idaho in December of 2011, she had no idea that she would be sharing that 196 square foot living space with so many other living creatures. 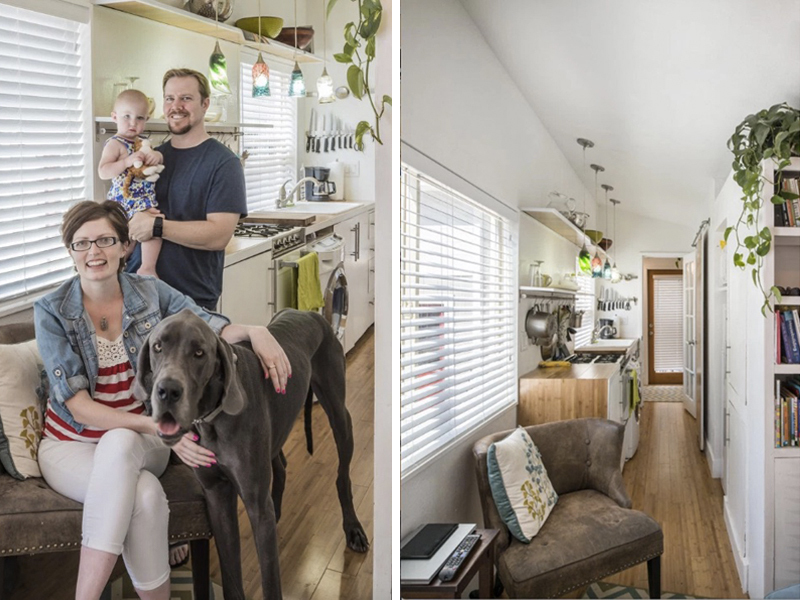 Along the way, Macy met her partner, who helped her finish the tiny house, had two children with him, and also manages to share the slightly expanded space with a Great Dane. We've long daydreamed about a tiny home of our own, but it seemed like a far-off plan for when the kids are grown, and we have the time and energy to try something new. Macy's example just goes to show that any time can be the right time to downsize -- or at least declutter -- and that tiny home living can allow you to focus on what matters most to you. In the case of Macy and her family, that's spending time together, worrying less about mortgages or rent, and keeping life mindful and intentional. Read on for more about this amazing, yet family friendly tiny home and the brains (and muscle) behind it. 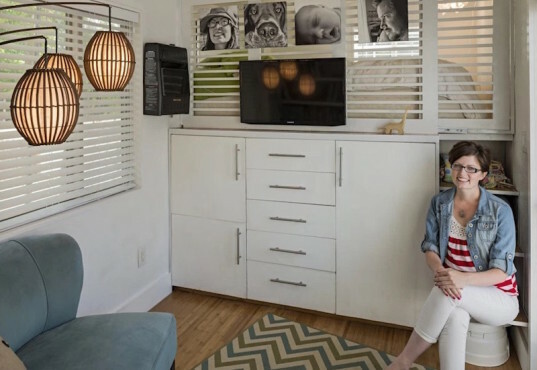 Macy and her partner also added on a small, but, for such a tiny place, substantial space prior to the birth of their second child. As Macy said, “I felt it was important to add on a separate sleep area so there were two different rooms so kid #1 (Hazel) has an area to play while kid #2 (Miles) has a quiet area to nap, and visa versa. Those pesky nap schedules are pretty important!” We couldn’t agree more and are pretty astounded by how uncramped and airy the space actually seems. While Macy may swap the toddler-sized bunks for twin beds in the future, right now the tiny house currently fits their family’s needs. With an optimistic attitude and flexibility about the future, Macy says, “We have modified as needed along the way. We will be in the house as is for a few more years. James and I are both project people and we are getting antsy to start our next house… We’re trying to just enjoy the downtime from working on things.” Also enjoying the tiny house: the family’s Great Dane, who appears to take up a generous portion of floor space wherever he settles. 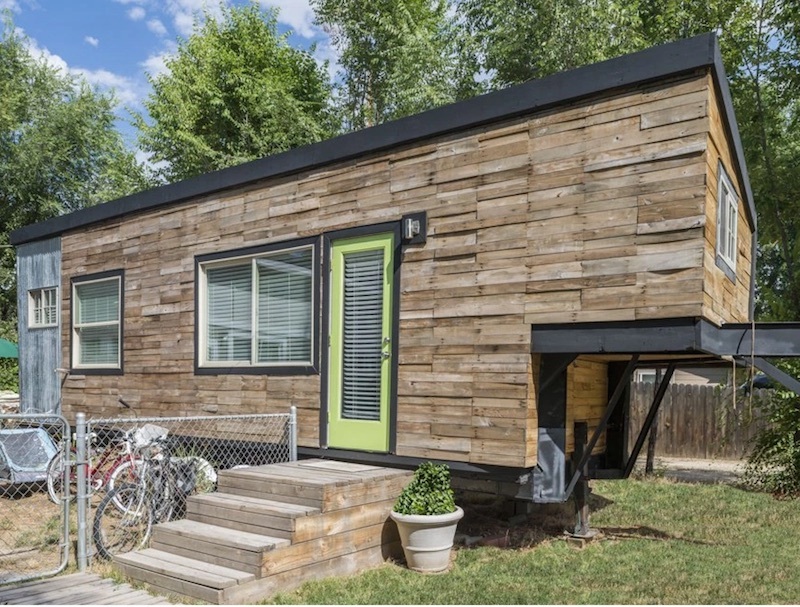 The space, which includes reclaimed wood countertops, radiant floor heating, a lofted bed, and a composting toilet, sits on a flatbed trailer. It looks enviably clutter-free and streamlined, yet cozy and extremely livable with family photos adorning “room” dividers, cheery chevron rugs, and a combination of bright colors in conjunction with serene white cabinets and storage areas. If you think a tiny home might be in your future, Macy recommends trying the lifestyle for a bit before committing: there are tons of Airbnb tiny houses out there now where you can get your feet wet without diving in head first! [Tiny house living] not for everyone but it can be pretty great!” Next up for the hands-on family is renovating and restoring a vintage trailer for traveling around the country! At a young age, Macy began dreaming up construction plans for pet dwellings. Her interest in design and building, as well as a predilection for minimalist living, resulted in her pursuing a professional degree in architecture. Dissatisfied with renting, Macy decided to take matters into her own hands and began building her own home in 2011, learning much along the way. The process took longer than she had anticipated (eighteen months instead of her estimated six), but Macy did the vast majority of the hands-on work herself! At the time she began construction, Macy didn't have kids or family on the brain, but the arrival of her daughter quickly galvanized her and her partner to make necessary changes, always with the attitude of "We just roll with it as it comes!" Macy and her partner also added on a small, but, for such a tiny place, substantial space prior to the birth of their second child. As Macy said, "I felt it was important to add on a separate sleep area so there were two different rooms so kid #1 (Hazel) has an area to play while kid #2 (Miles) has a quiet area to nap, and visa versa. Those pesky nap schedules are pretty important!" We couldn't agree more and are pretty astounded by how uncramped and airy the space actually seems. While Macy may swap the toddler-sized bunks for twin beds in the future, right now the tiny house currently fits their family's needs. With an optimistic attitude and flexibility about the future, Macy says, "We have modified as needed along the way. We will be in the house as is for a few more years. James and I are both project people and we are getting antsy to start our next house... We're trying to just enjoy the downtime from working on things." Also enjoying the tiny house: the family's Great Dane, who appears to take up a generous portion of floor space wherever he settles. The space, which includes reclaimed wood countertops, radiant floor heating, a lofted bed, and a composting toilet, sits on a flatbed trailer. It looks enviably clutter-free and streamlined, yet cozy and extremely livable with family photos adorning "room" dividers, cheery chevron rugs, and a combination of bright colors in conjunction with serene white cabinets and storage areas. If you think a tiny home might be in your future, Macy recommends trying the lifestyle for a bit before committing: there are tons of Airbnb tiny houses out there now where you can get your feet wet without diving in head first! [Tiny house living] not for everyone but it can be pretty great!" Next up for the hands-on family is renovating and restoring a vintage trailer for traveling around the country!